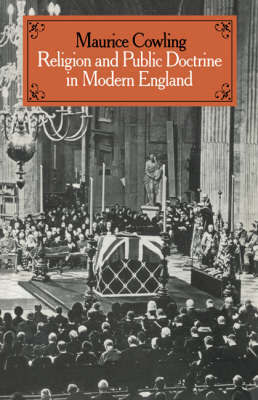 In Religion and Public Doctrine in Modern England, Maurice Cowling defines the principles according to which the intellectual history of modern England should be written and argue that the history of Christianity is of primary importance. In this volume, which is self-contained, he makes a further contribution to understanding the role which Christianity has played in modern English thought. There are critical accounts of the thought of Toynbee, T. S. Eliot, Collingwood, Butterfield, Oakeshott, David Knowles, Evelyn Waugh and Churchill. It also contains less extended accounts of the thought of A. N. Whitehead, of Enoch Powell Minister. The book is given coherence by the connected ideas of the ubiquity of religion, of literature as an instrument of religious indoctrination, and of the intimacy of the connections between the political, philosophical, literary and religious assumptions that are to be found among the leaders of the English intelligentsia.